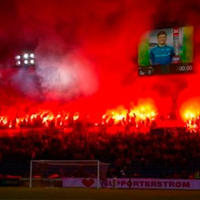 Norway: Stands to be set alight again? As Klanen (supporter trust of Vålerenga) informs, last Friday a meeting was held between the national fans alliance (NSA), football association (NFF), league authorities (NTF), the police and Vålerenga club. The outcome sounds optimistic for supporters who are campaigning from the start of the season to bring pyrotechnics back to the stands. Just as a reminder, Norwegian football authorities banned the use of flares inside stands ahead of the newly opened 2013 season without even informing supporters. Fans are still allowed to prepare 'pyroshows' in front of stands, but they don't want to settle with this. And after the meeting it seems there's a chance to bring the light back inside again. A trial period will begin next week on condition that none of this weekend's games will be interrupted by pyrotechnics incidents. If this round of games passes without trouble, fans will be able to apply for approval, one for each show they want to create. Authorities claim more focus will be given to safety, but there is no specific restriction applied by the approach. What's more, Klanen inform that authorities agreed to talk about changing the law to make things even simpler. According to proposals set by NSA, fans would have to apply for only one approval ahead of the season and would then be allowed to light flares during home and away games. Of course fans agree that various safety measures need to be taken to assure no-one gets hurt in the process.